Season the duck legs on all sides with salt and pepper, and dredge with flour, shaking off any excess. To Braise the Duck Legs: Melt the butter in a large saucepan, add the bacon lardons and sauté. When the lardons are browned, lift them out with a slotted spoon and reserve. Add the prepared duck legs and brown on all sides. Remove the legs from the pan. Add the onions and simmer until translucent. De-glaze the pan with white wine. Return the duck legs and lardons to the pan. Add 1 1/2 cups stock, cover and simmer until the legs are tender (20 - 30 minutes) Cooking times vary depending on size and species of duck. Test for doneness with a fork, meat will fall from the bone and juices will be clear. Remove legs from the pan; continue to heat sauce to reduce by half, then strain sauce. To Prepare the Spätzle: Place the flour in a large mixing bowl with the salt, nutmeg, pepper, and parsley. Break the eggs into a small bowl and beat well with a fork. Gradually pour the eggs into the flour, mixing thoroughly with your hand or flexible rubber spatula. Add the water a little at a time and mix until the dough no longer adheres to the sides of the bowl. The dough should be rather firm, the consistency of a thick batter. Bring 2 quarts of water with 2 tablespoons salt to a rapid boil. Cover the pot of boiling water with a spätzle maker or a colander with large holes (1/4 - 3/8 inch in diameter). Force the dough through the holes with the rubber spatula. Use about 1/3 of the dough at a time. Allow the spätzle to cook until it rises to the surface (3 - 5 minutes). Using a slotted spoon, transfer the cooked spätzle into a large bowl of cold water. Repeat until all the dough is used. To Serve: Thoroughly drain the spätzle in a colander. Melt the butter in a skillet. When the butter begins to brown, add the spätzle and sauté for 1 - 2 minutes until hot. Season with salt and pepper and serve on warmed plates. 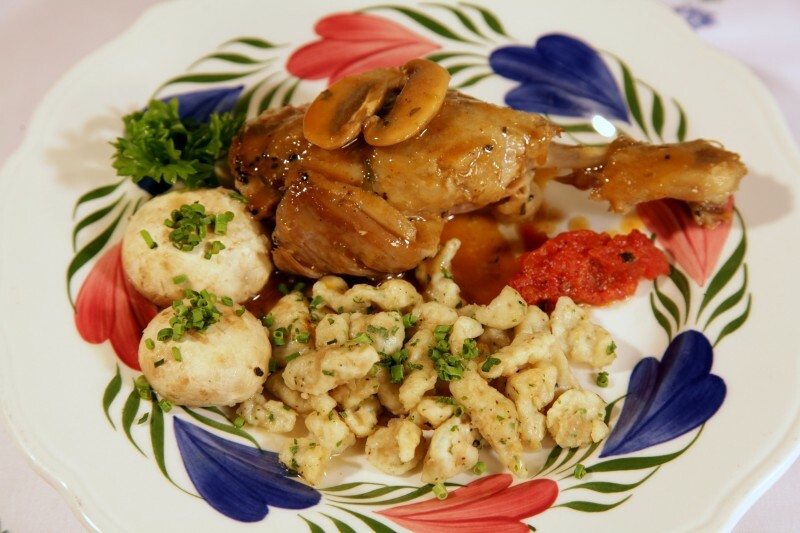 Serve two duck legs per plate with sauce and spätzle.